It is game day in Allen as the Americans take on the Wichita Thunder in the only Tuesday night home game of the season. 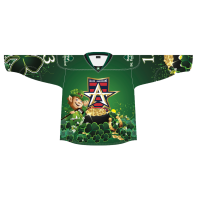 Allen will be wearing special St. Patrick’s Day jerseys tonight which will be auctioned off immediately after the game. – If you like hard nosed hockey where you see players finishing checks, plenty of chirping, a lot of scrums and most likely some fights the game tonight between Allen and Wichita should be right in your wheelhouse. These two teams have already played each other twelve times with five more to go. They are two of the most penalized teams in the ECHL (Allen #1, Wichita #3) with a combined average of 45 penalty minutes per game. In the last five games against each other they have averaged 72 penalty minutes per game. – Despite all of the time spent in the penalty box the games between Allen and Wichita have been close. In their twelve prior meetings this season the margin of victory was one goal seven times and two goals four times. Two of the games were won in overtime and three in shootouts. Allen has won seven of the twelve prior meetings including five of the last seven. Allen’s record against Wichita is 7-1-2-2. If you look at past results you would expect a hard fought game, players finishing checks, lots of penalties by both teams, shots on goal in the 30’s by both teams and special teams making the difference. The margin of victory will be one or two goals and the game could end up in overtime. Allen is ranked #3 in league standings. Wichita is ranked #18. Allen is #1 in average goals scored per game (4.02). Wichita is #14 (3.05). Allen is ranked #9 in average goals allowed (2.88). Wichita is #22 (3.29). – Special teams is almost always the key to victory and Allen has the edge in this department. If you look at the head to head matchups in the twelve games played this season Allen has gone 16-75 (21.3%) on the power play and Wichita has gone 11-68 (16.2%) on the power play. More broadly at home Allen is ranked #13 (17.7%) on the power play and #7 (86.5%) on the penalty kill. On the road, Wichita is #24 (14.0%) on the power play and #14 (82.7%) on the penalty kill. – A recent concern for Allen has been the effectiveness of the penalty kill unit. This can be illustrated by looking at the twelve games played against Wichita. In the first eight games played which were between October & February the Americans only allowed Wichita 3-37 on the power play for a penalty kill percentage of 91.9%. In the last four games played since the middle of February Allen has allowed Wichita to go 8-31 on the power play for a penalty kill percentage of just 74.2%. – In the last six games between Allen and Wichita the winning team has had at least five goals. Allen has lost to Wichita in regulation only once all year but has lost four of the five games that have gone to overtime. – The on ice officials scheduled for tonight are referee Peter MacDougall (#26) and linesmen Mike Anderson and Brian Bull. – You have most likely read by now that Jack Combs was placed on waivers yesterday by the Stockton Thunder. Can’t remember the last time so many questions have been asked about a player transaction. This is obviously a long story with several twists and turns complicated by the ECHL rules. When Jack left for Sweden back in January the assumption many fans made was if it didn’t work out he would be able to return to Allen where he was the leagues leading scorer. When Combs decided to come back to the US the rules prohibited this from happening. Once a player leaves for Europe they must wait 45 days before they can return to the same team and because Jack left so late in the season the 45 days was after the deadline (February 15) for signing players from Europe. This meant coach Martinson only had two choices according to the ECHL rules when he found out Jack was returning to the US. The first option was to trade Jack to another ECHL team and get a player in return. The second option was to waive Jack and have a slim chance he could be traded back to Allen. He decided on the waiver option and waived Combs on February 14. Under the ECHL rules if only one team claims a waived player they can be traded immediately but if more than one team puts in a waiver claim the player can’t be traded for thirty days. Another catch-22 for Combs as 30 days after he was claimed was beyond the March 12 ECHL trade deadline. Never heard it officially but seven teams supposedly put in claims for Combs and Stockton was the team that got him. What was happening from the time Jack was claimed by Stockton until the trade deadline was an effort by Combs’ agent to get those six other teams to drop their waiver claims and if that happened he could immediately be traded back to Allen. The trade deadline came and went and unofficially all but two teams dropped their waiver claim. – So why would Stockton waive Combs yesterday. Don’t have any information from an official source but feel confident it has nothing to do with performance, attitude, locker room demeanor or any of the other reasons you see thrown out on social media. Jacks’s interest is getting back to the team he signed with and wants to play for in the playoffs. Stockton is going nowhere and is trying to help Jack get back to Allen or at least to a playoff team. What are the chances Allen can get Combs back through the waiver process. Not great but probably better than most fans might think. Teams have 24 hours to put in claims so by tonight the number of teams claiming Jack will be known. 1. Jack is a veteran player so a team must have a vet spot available or cut a vet that has been with the team all year. 2. Teams that are not in playoff contention have little to gain in claiming Combs. 3. Combs is a high end player that has a high end salary. Many teams would not be able deal with the salary cap issues in taking on his contract. 4. Combs is a six year professional who has made it clear his interest is to play in Allen and could be asking teams to respect his interest. Will teams want to pay top dollar for a player that doesn’t want to be there? Will teams consider the players interest in trying to get back to the team he thought he could return to when he went to Europe only to be hung up by ECHL rules. Many will say there is no way teams will do this but what goes around comes around so never say never. It will be wait and see on this one. The regular season is coming to an end quickly with some teams having as few as nine games remaining. Playoff rosters are due April 13 and coaches are already working hard at figuring out what the playoff rosters will look like. The playoff roster can be a maximum of 23 players (not 24 as reported in an earlier post). Nineteen on the active roster and four on reserve. Players must play a minimum of five (5) regular season ECHL games to be eligible for inclusion on the playoff roster. Furthermore, players on two way AHL contracts must have appeared in five (5) AHL regular season games, however, at the discretion of the ECHL team, up to two (2) AHL two way contracted players may be exempt from this requirement. Veteran players on a two way AHL contract must have appeared in at least 10 AHL regular season games. There are no exemptions permitted for these players. Coach Martinson expects to be at the max roster (23 players) going into the playoffs. According to the ECHL calendar, the playoffs are scheduled to start on April 15. With Allen being the number one seed in the division they will start the first round at home. All playoff series are 2-3-2 unless both teams agree otherwise or limited date availability at an arena requires a deviation. Any change to the 2-3-2 format requires approval by the ECHL. If you go to the Allen Event Center (AEC) website their calendar shows a gun show on the first weekend of the playoffs (April 18 & 19) so you can expect mid week playoff games just like last year but nothing official has been announced. However, since the playoffs can start on April 15th and the AEC is not available on the weekend an educated guess would be Wednesday the 15th for the first playoff game. DID YOU KNOW: The Allen Americans have never missed the playoffs. They have been in thirteen playoff series in the last five years and won ten of them. Steve Martinson has never been defeated in a playoff series as the coach of the Americans. He has coached the Americans in 36 playoff games and has a record of 24-12.